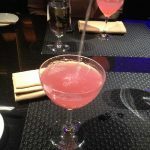 ARIA Las Vegas: A Thousand Ways to Say "Wow! 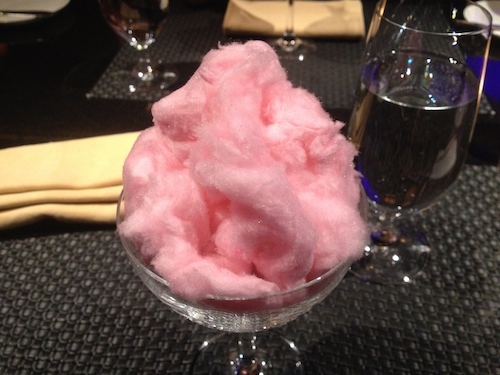 When I first arrived at ARIA Las Vegas, I was a mite rough and dry, like the cotton candy you see in those cocktail glasses below. It took only an hour or so before I was flowing with a glow, feeling much as you see in the second shot, that cotton candy in a better mood. 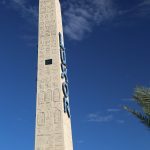 I was part of a media group stay, and the “where” of the stay was the beginning of the “wows.” I floated above the Strip on the 36th floor, in one of the splendid Sky Suites, ARIA’s “hotel within a hotel” and a Forbes 5-star winner. This ain’t your father’s Vegas: my roomy rooms were operated by a touch-screen control panel, where, as the Wizard of ARIA, I could make minute adjustments over things like the temperature in individual rooms, the music in the same, the open/shut/partially open state of the drapes (both sheer and blackout), the soft cast of all the many individual lights. Heck, the panel could probably adjust the prescription of my glasses, but I couldn’t figure that one out. Truly, the world is now an iPad. But my, the view. 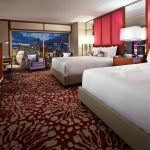 If you’ve never managed to get out of your hotel casino in Vegas, you might not know that the city is surrounded by mountains, which glow ever so lovely in the twinkly dawn out of the Sky Suite’s ginormous picture windows. But I did have to leave my angel-food cake bed, my plush jet-bath tub, my 24-hour concierge and my wizard’s panel behind, and do some ARIA exploring—and exploring is no exaggeration. 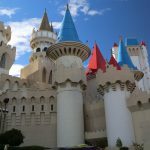 The resort is a complex of more than 6 million square feet, encompassing 4,000 guest rooms, the casino, 16 restaurants, an expansive conference center, shops, Cirque du Soleil theatre, bars and nightclubs, multiple pools—and I’m sure this is where Santa’s Summer Workshop is located too. That’s not even counting the massive entrancement of opulent shopping a swift stroll away at Crystals, ARIA’s sister shopping center next door. Wear comfortable shoes and hydrate. Or wear gigantic heels and have a martini at 9am—this is Vegas, after all. Vegas it is, but as I said: not your parents’ Vegas. 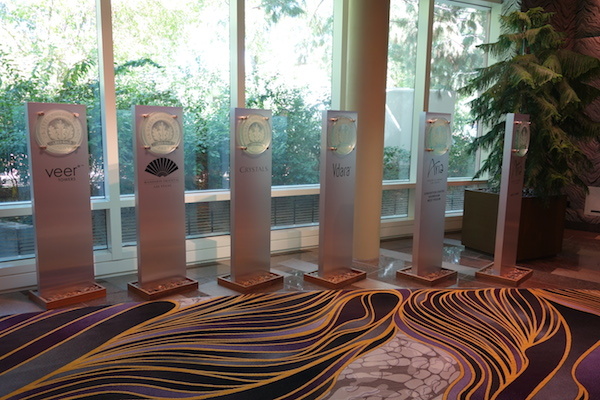 The U.S. Green Building Council awarded LEED Gold certification to ARIA’s hotel tower, convention center and theater. Frost that cake with the foremost “green” ranking for sustainable hotel operations: the 5 Keys designation by the Green Key Eco-Rating Program. You can see that sustainability and innovation aren’t treated lightly here: there’s extensive use of natural light—no dank casino grottoes to hide in. 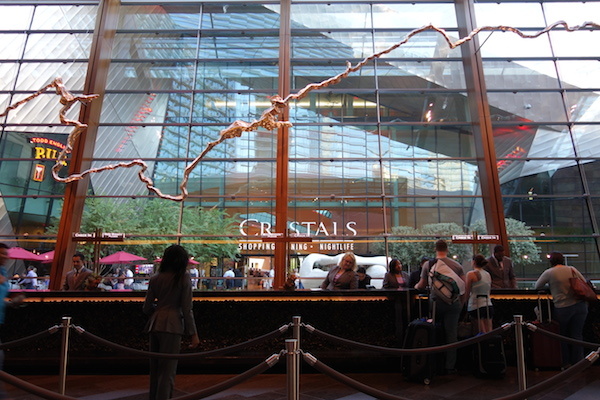 Pelli Clarke Pelli, the famed architects who designed the joint made extensive use of reclaimed materials—a striking instance of that is the reclaimed silver rendering of the Colorado river that flows above the check-in counter. 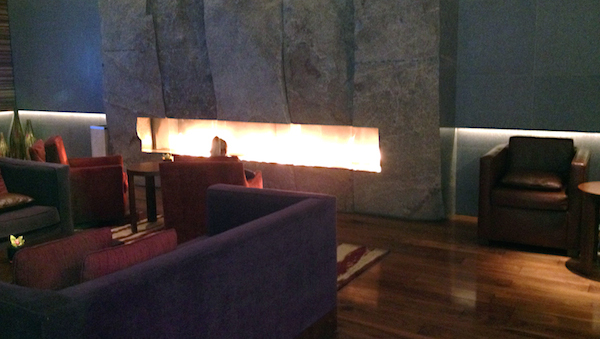 Air-conditioning flows from the floor up, so it cools more naturally, and any smoke is quickly wafted away. They’ve even got their limos running on natural gas. 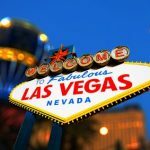 Green Vegas—who woulda thunk it? 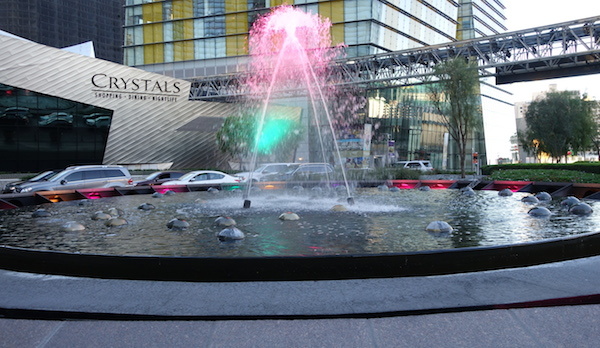 Crystals, the wonder world that is the luxury shopping center next door, has LEED certification too. The lighting sensors adjust for the natural light, and their smoke detectors are laser beams—they needed a little more precision to prevent any fire-protection flooding. After all, when you have a Richard Mille store with a watch that goes for $700,000, you don’t want the band to get damp. The architecture of the 500,000 square-foot complex is visually arresting, and some percentage of its 30,000 visitors per day (more on weekends) undoubtedly come just to gawk. However, many come to buy, since it’s ranked in the top ten in sales per square foot for shopping centers across the country. The brands—among them Tom Ford, Lalique, Porsche Design, Stella McCartney, Sisley, and a host of others—are among the most prestigious in the world. And there are those certain touches, such as the center having no blaring aisle kiosks, open spaces flowing with eye-catching water features and incredible displays of fresh flowers (more than $200,000 spent on them per year), that tell you you’re far, far from a conventional mall, and one with much more polish than glitz. 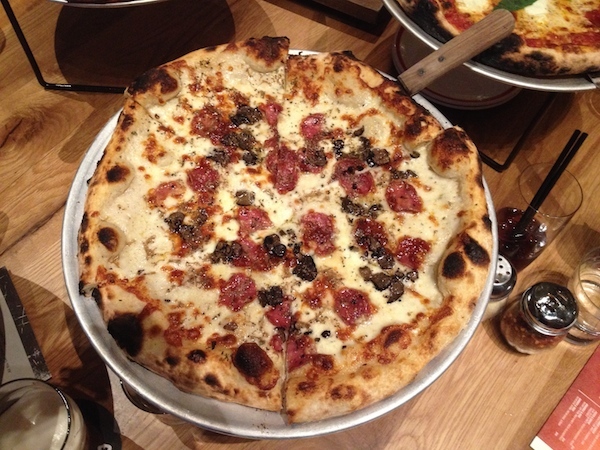 The truffle pizza at Five50—don’t touch, it’s mine! The paella at Julian Serrano, the Chilean sea bass at Jean Georges, the foie gras custard brioche at Sage, the truffle pizza at Five50. And such a dizzying array of savory appetizers at all of them, tequila/tabasco-laced oysters, fresh tuna “ice cream” cones, mushroom risotto cheese balls. Not to mention wonderful wines and thrilling desserts. I only wish this page was scratch and sniff: you’d swoon. Talking of tippling, we had the fizzy pleasure of a champagne tasting cordially presided over by sommelier Kim Wood, a fountain of champagne knowledge. 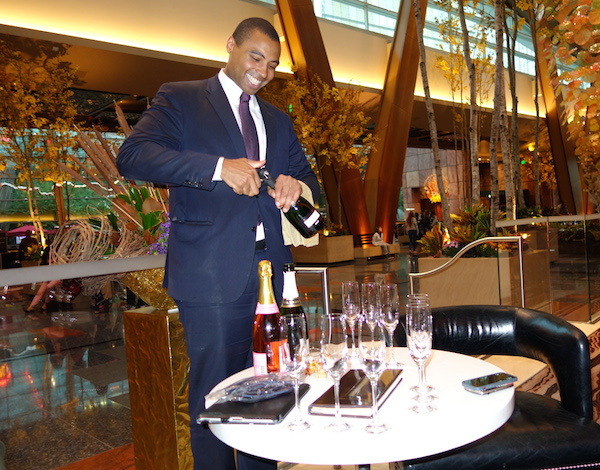 The ARIA has a deep champagne program: just at the Lobby bar alone there are 125 selections, 12 by the glass. 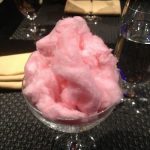 And that pink cocktail that began this odyssey above: that’s a Pink Cashmere, whipped up by Craig Schoettler, the award-winning mixologist at Sage, who also tickled our skulls with a liquid-nitrogen Boulevardier. Heady stuff all around. 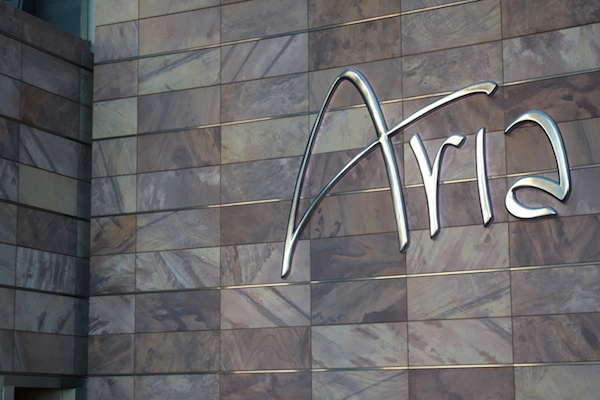 I have a confession to make: I had a facial at ARIA. Since most of the time I pretend I don’t have much of a face (and the world nods in agreement), the thought of getting a facial never occurred to me. But now, there’s life before my facial and life after. There’s something about having your face slathered in successive layers of fragrant oils and unguents, then having successive applications of warm, damp towels put over that slathered face, in a candle-lit scented room. This was not torture. Plus, I had my hands and feet encased in little baggies filled with warm paraffin. Oooh. 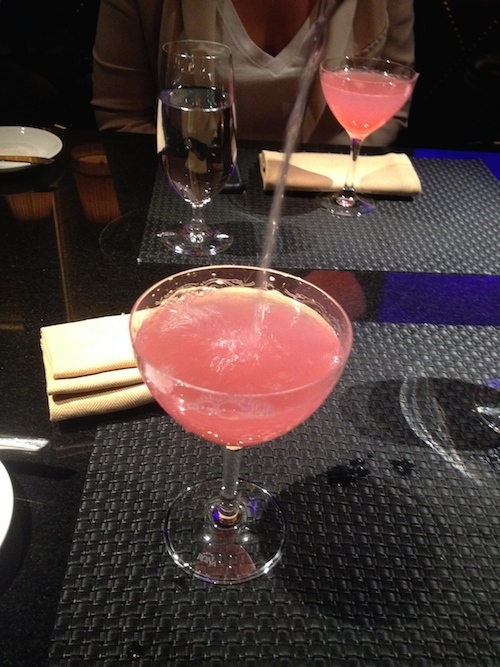 The next day, I had a luxuriant massage over at Vdara, ARIA’s sister hotel. Floating. Better yet, the therapist sounded exactly like Terry Gross from NPR, so I felt as though I was in an important interview. 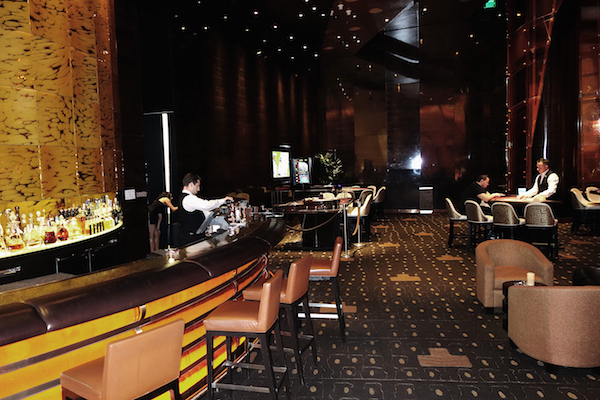 Both ARIA and Vdara have various scent and burbling-water meditation rooms (including a Fire Lounge and Salt Room) where you can more deeply jellify after the treatments. You will glow. Dang, I almost forgot. There’s a very nice casino in the ARIA. I’m a guy that loves a comfy blackjack table, but there’s so much to do in the hotel that I barely played. 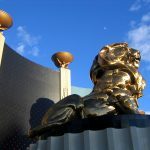 But if gaming is your thing, there’s a substantial main casino with all the trimmings, and several appealing, semi-private high-stakes enclaves, some with their own beautiful bars. Good luck! 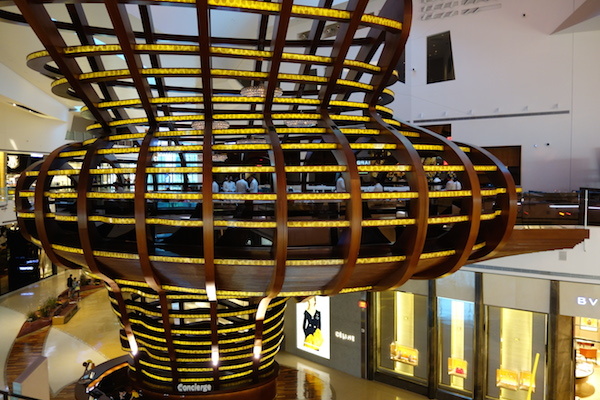 I didn’t have to run far, because the ARIA hosts the Zarkana performance by Cirque du Soleil in its roomy theatre. The performance is worth describing in detail, so I’m going to write a separate post devoted to that. 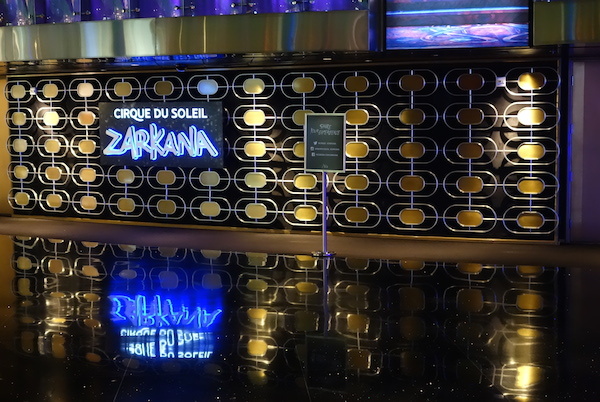 But let me tantalize you with this: Zarkana is an enveloping, all-senses engaged performance. It’s got enough pizazz to add many extra Z’s. I was enthralled. 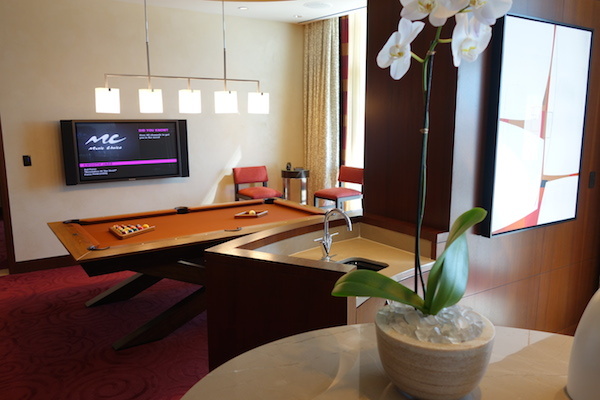 And if the details aren’t fully to your liking, staying in the Sky Suites gives you a 24-hour concierge. They like to help. Sure, ARIA’s entire City Center complex cost $8.5 billion—they can afford to do it right. The best thing is that they did. Paraffin spa, Cirque du Soleil and Terry Gross? Soundss like a good time to me. Penny, as you might suspect, the only real problems were the indulgence levels—the food was tantalizing, and I succumbed (again and again). I never did make it to the nice gym they have there. But those don’t really qualify as complaints. And Dave, I didn’t even need a trained nose to do any real sniffing—all these goodnesses were served up, with gusto—it was magic!